Rachel Roberts is an Australian illustrator based in Singapore. All of her pictures are drawn by hand – pencil on paper – thus her brand name, pencil pusher. Rachel produced ‘Sowing dangerous seeds’ for the Dangerous Women Project by creating a series of hand-drawn pictures (graphite, aquarelle, pastel), which are integrated and augmented digitally. Rachel works on commission and produces self-initiated work. Find out more about Rachel’s art on Facebook and Instagram. In some parts of the world, when a girl dares to speak up, she challenges those who benefit from her silence. She places herself in harm’s way by daring to choose courage over fear. This is a choice that Malala Yousafzai made. As a mother of daughters myself, Malala’s plight offers a relatable, awe-inspiring example of courage, perseverance and strength. True grit. At a time and place when it was dangerous to speak up, Malala advocated for her personal right, and the right of all girls and women to an education. And, despite being shot in the head at point-blank range for doing so, she continues to stand up for the power of education today. While the danger faced by Malala does not stand alone – scores of girls and women are yet to realise full and equal rights – she is a recognisable champion for change. 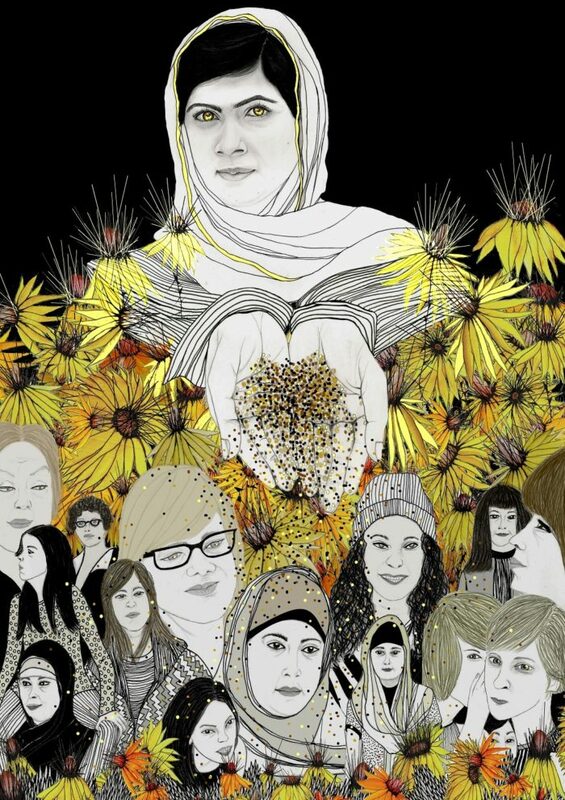 It is for this reason that my illustration, ‘Sowing dangerous seeds’, features Malala. Here, she is calmly, resolutely pouring seeds that bear beautiful, but dangerous foliage, which surrounds her and a group of women and girls. The seeds represent Malala’s ‘dangerous’ idea – that girls have a right to education – while the foliage represents the dangerous environment that this idea can (and does) create. And, thanks to Malala’s activism, the growing global awareness of girls’ right to, and inclusion in, education is represented by the women and girls within the foliage. Malala represents what it means to me to be a dangerous woman; a woman determined to realise a powerful and positive idea even in the face of danger.